In Newbury, New Hampshire, the tradition of passing a cane from one elder statesman to another seems to have begun with the Sunapee Lake Grange. In March, 1892, the grange voted to purchase a cane for William H. Sawyer who was, most likely, the group’s eldest member. It was understood that the gift would cost no more than $5.00 and no less than $3.00. Following the first recipient’s death, the cane was passed to David D. Rowe in March 1895. Upon that occasion, Brother Rowe declared, "I will accept the cane and thank you. When I am done with it, I want it presented to the oldest brother in the grange." And so it was passed along: in 1907 it was handed to Spargue A. Morse; in 1914, Jonathan A. Merill; in 1926, Nathan B. Bly; in 1927, Charles Newman; in 1931, George Kidder; and in 1932, Allen Jones. In December of 1932, the cane described as gold-headed, was presented to Eugene S. Muzzey. Interestingly, the minutes noted that "Bro. F[rank P.] Spaulding [is] oldest, but already has cane." The last bearer of the grange cane was Sidney C. Merrill who held it from December of 1934 until his death a year later. It was at this time the grange cane was lost. In January of 1939 the "question of the grange cane" was discussed, but no action was taken to continue the tradition. Whether or not this custom was unique to Sunapee Lake Grange or was typical of other granges is uncertain. In a recent issue of the Bay State Historical League Bulletin, Ross W. Beales, Jr. Reports that "in 1909 Edwin A. Grozier, editor of the Boston Post, distributed gold-headed canes to chairmen of boards of selectmen in 700 New England towns, asking that the canes be presented to the oldest citizen of each town and thereafter be transmitted to successive oldest citizens." The cane was especially manufactured by J. F. Fradley & Co. of New York and featured a stick of African Gabon ebony and a head of rolled 14-karat gold. Each was inscribed as follows: "Presented by The Boston Post TO THE OLDEST CITIZEN OF". A blank space was provided whereby the name of the town could be engraved locally, if so desired. There is little evidence to verify that Newbury was actually included among the 700 New England towns to receive a Boston Post cane. Unfortunately, there is no list of which towns received them. A cursory glance at the Argus & Spectator and the Republican Champion reveals no mention of the Boston Post cane under the Newbury news during the latter part of 1909. So far, none of our long-time residents can recall if anyone in Newbury ever received one. In fact, the only suggestion that Newbury may have received a Boston Post cane is the grange secretary’s reference to another cane being in the possession of Frank Spaulding. 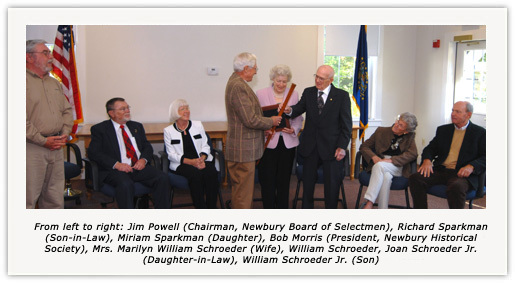 In honor of Newbury’s Bicentennial, the tradition of a cane honoring the eldest resident was revived by the Women’s Helpful Organization of South Newbury. Sandy Gove, as reported in the Argus Champion, "hunted through antique shops, novelty stores and theater prop rooms for several weeks, [stating] she finally located [an] old cane with appropriate age for the occasion in a Newport antique shop." The silver-headed stick was dated 1794 and the bore initials "J.M." The understanding was that it once belonged to James Madison, forth President of the United States. On Saturday July 29, 1978, Newbury Selectmen James Wright, George Beal, and Frank Veazie presented the cane to the town’s oldest resident, 98-year-old Moses Herman Bly. Mr. Bly was a descendant of original settlers and lived to be 100 years old. At the time of his death in 1980, it was discovered that this cane had also been misplaced. To insure the custom would continue, Mr. Bly’s niece, Florence (Bly) Perkins, arranged to procure a replacement. A block of cherry (?) was acquired from George E. Alexander & Son Wood Products of Sunapee. The bronze Newbury Bicentennial souvenir was provided by Mrs. Perkins’ daughter-in-law, Dotty Perkins. The materials were brought to Nicholas Scalera, a craftsman from the neighboring town of Goshen, who turned the stick and embedded the medallion. The new Bicentennial Cane was presented to Dominic Digilio on June 19, 1982, his 94th birthday. A native of Venosa, Italy, Mr. Digilio came to Newbury in 1904. He raised a family of six children and actively tended his farm on Baker Hill for more than 80 years. Mr. Digilio lived to be 99 years old. At the March, 1989 town meeting, Frank Yager made the motion that the responsibility for overseeing the transmission of the Bicentennial Cane be transferred from the Selectmen to the Newbury Historical Society. The motion was adopted unanimously. After considerable research, the Society determined that the cane should be presented to the oldest person, male or female, who is on the town checklist and has lived in town for a minimum of ten years. It is understood that, should the bearer move away from the general community, the cane shall then be passed along to his or her successor. The Bicentennial Cane was next presented to James Wright of Mt. Sunapee on June 25th, 1989 when he was 92 years old. Born in Ellenburg, New York, he was one of approximately 800 surviving veterans of the first World War. Throughout his professional life, "Pop" Wright worked as a farmer, a contractor, a mason, and a sawyer. In 1928, he and his wife, Minnie (Fortune) Wright, bought the 200-year-old farmhouse in which he lived for the rest of his life. The couple raised two children, Virginia and James Marvin. On June 19, 1999 the Newbury Bicentennial Cane was presented to 95 year-old Florence Bly Perkins. She was a most fitting recipient since she was the one who arranged for the crafting of this Cane after the previous one was lost. A lifelong resident of Newbury, she was a member of Grange and contributed to the preservation of Newbury history by writing a little book entitled "Grammies Memories". She also prepared and presented two albums of photographs to the library. Mrs. Perkins was the wife of Merton and had two children, Richard and Janice. The Cane was next presented on July 15, 2001 to Mr. George Gilbert Ferren, who was born on August 7, 1906 in Allston, Massachusetts. Mr. Ferren and his wife, Dorothy, made Newbury their permanent home in 1970, though they have been coming up here for skiing vacations since the 1950’s. Together, they raised a family of four sons and one daughter. Professionally, he has worked in the air conditioning business for many years and was a longtime employee of Harvard University. Mr. Ferren is a lifelong athlete and sportsman. An avid skier, he has ranked top in his age group in NASTAR races. He started the rifle club in North Reading, Massachusetts, has earned many medals for his sharp-shooting, and went on to become the head of Massachusetts Rifle Association. As a young man, Mr. Ferren ran in the Boston Marathon, completing along with multiple-time winner, Clarence Demar of Reading. On December 16, 2006, the Newbury Bicentennial Cane was presented to Mrs. Helen Appleby who was born 99 years earlier on April 3rd in Dover, NH. With her husband Earl, she raised two sons. They in turn gave her 5 grandchildren. She now has 5 great grandchildren and one great-great- grandchild. The Applebys first visited Newbury in 1948 and like it so much they become residents in 1950. Mrs. Appleby’s career was that of a wife and mother, but also found time to contribute to her community. She has been active in the Methodist church and was president of the Women’s Group for a number of years. She also was a member of the New London Hospital Auxiliary for over twenty years. In addition she finds satisfaction in being an accomplished pianist. Today, October 4, 2008, the tradition continues. Our distinguished recipient of the Newbury Bicentennial Cane is William Henry ("Bill") Schroeder. He was born March 2, 1913 in Patterson, NJ and grew up in nearby Totowa, NJ. Mr. Schroeder spent nearly all of his working career in the installation of High Voltage distribution lines, working for both Public Service of Newark and other private contractors. He worked on several large projects in the New Jersey area including the New Jersey Turnpike, Fort Dix, and the Westinghouse plants. In his leisure time he has enjoyed a lifetime of hunting and fishing in New Hampshire and New Jersey. Following his retirement in 1978 he relocated to Newbury in 1982. Mr. Schroeder and his wife Marilyn have 2 children, William Jr. of Newbury and Mrs. Marion Schroeder Sparkman of Naples, FL. They have 9 grandchildren and 11 great grandchildren.